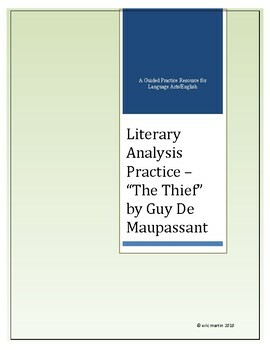 This resource is designed as a guided practice activity for students learning the in's-and-out's of literary analysis. 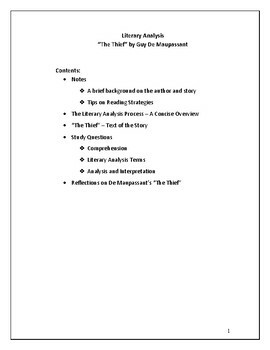 With some very brief notes on the central text and some notes on the process of literary analysis, this is a resource that explains itself to the student - which makes it a good resource for independent study, early college homework assignment, home school course work, or supplemental summer reading for high school students. 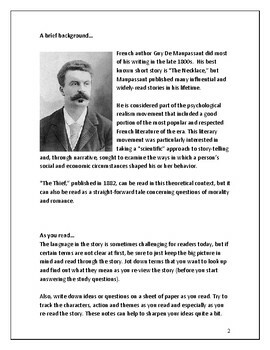 The text for this resource is a 1,900 word story by 19th century writer, Guy De Maupassant. This is a nearly ideal story for teaching literary analysis skills because (1) it's very short yet complex in its themes and (2) it's just challenging enough in its vocabulary and syntax to stretch some students without breaking them or boring them. The center of the story is an illicit love affair and that's always great for generating student interest. The full text of the short story, "The Thief," is included here (it's in the public domain, so no copyright issues). 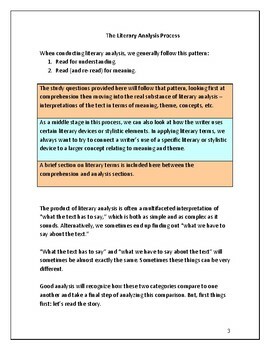 The resource is designed and formatted to be used electronically, though much of the content can be used in the classroom on a projector or printed out.